This page is our travel log for the year 2015. This way our family and friends can see where we visited and stayed at throughout the year as well as future confirmed reservations on where we will be staying or are planning to be staying at. We will update this page as we travel or should our travel plans change. The oldest entry is at the top of the page and the most recent entry is at the bottom of the page. We started traveling fulltime on June 22, 2011; we started living fulltime in our RV in May 2010 while we were preparing our home for sale and selling off most of our possessions. This is our 5th year of fulltime traveling and our 6th year of living fulltime in our motor coach. Here is a link to Our Visited Places; this is our page listing all of the places that we have been to together "as a couple" since 1996. 12/26/14 - 01/16/15 Benson, AZ Camped at Valley Vista RV Resort (Thousand Trails/Encore) in Benson, AZ for 21 nights in a 50 Amp FHU site. This campground is located in the San Pedro River Valley south of I-10 on AZ State Route 80 along side the San Pedro River. The amenities include: a clubhouse; swimming pool; Whirlpool/Spa/Hot Tub; Public Restrooms/Showers; Laundry Facilities; and Laundry Facilities. This is one of our Thousand Trails bonus parks that is available as free to us for a 5 year time frame. We opted for the 50 amp upgrade at a cost of $2.00 per day for a total electric cost of $42.00 because of the cooler night temperatures, and the need to use our coach electric furnace. It is a very nice Encore campground with 125 campsites. We are Elite Connections members of Thousand Trails/NACO/Leisure Time/Mid-Atlantic/Outdoor World; a private campground membership. Our yearly maintenance fee of $607.87 allows us unlimited camping with no nightly camping fees at 81 different Thousand Trails/NACO/Leisure Time/Mid-Atlantic/Outdoor World nationwide campgrounds plus currently we get 14 extra bonus parks which are Encore campgrounds. Out of our 21 night stay here, we were able to visit our timeshare listed below for 13 of the nights. This is a highly recommended Encore RV Resort! Note 1: In route to this campground we purchased 80.67 gallons of diesel fuel (approx. 1/2 tank) at $2.78 per gallon costing a total of $225.00. Note 2: On Fri., 01/02/15 to Sun., 01/04/15, Debbie's friends/co-workers showed up to spend the weekend at our timeshare with us. They occupied the spare bedroom & the fold down queen murphy bed in the living room. There names were Kenyona Allen (co-worker at VVC), Raya Allen (sister to Kenyona), and Roena Allen (instructor at VVC & mother to both Kenyona & Raya). Debbie and her friends went to visit Garden of Gethsemane and ate breakfast at The Good Egg which are both located in Tucson, AZ. TS1: Stayed at WorldMark Rancho Vistoso for 13 nights in one of our timeshares; we stayed in a 2 BR suite. Located minutes north of Tucson, AZ in the beautiful Oro Valley with its giant saguaro cactus. This part of the country is perfect for January visits because of its mild Winter temps. We love WorldMark and we love staying in timeshares!!! 01/16/15 - 01/18/15 Quartzite, AZ Camped at B-10 RV Park and Campground in Quartzite, AZ for 2 nights. The campground is located directly across the street from Solar Bill RV Solar, so we needed to stay close by on Saturday so they can load test our chassis batteries. This RV park is level white rock with a laundry room & 2 RV dump station. This RV park is terribly overpriced at $71.75 for a two night stay. During our first night, the electric was so bad we had to move to a different site, and the water pressure is a continuous trickle at best. Too bad these RV parks have to gouge the RV Show attendees like this. Definitely not a recommended RV Park for the price. If they drop the price by 50% to say $15.00 per night, it would be a better value, even considering the low power electric & low water pressure. Next time we come to Quartzite, the solar should be working great, and we will be boondocking for sure. Note 1: In route to this campground we purchased 44.085 gallons of diesel fuel (approx. 1/4 tank) at $2.52 per gallon costing a total of $111.05. 01/18/15 - 01/25/15 Quartzite, AZ Camped at LA-Z-DAZE RV & Mobile Home Park in Quartzite, AZ for 6 nights. Note 1: On, Friday, 01/23/15 we went to our solar warranty appointment with Solar Bills, 630 W. Main Street, Quartzite, AZ 85346 / (619) 588-9852 to replace our eight (08) AGM batteries, and to rewire our solar system from series to parallel. The issue was that wired in series, the watts coming off of the solar panes was too high for the two solar controllers to handle. The warranted cost for the eight (08) new Lifeline AGM batteries ($1,600.00) along with a Blue Sky Battery Temp sensory ($40.00) came out to a total cost of $1,640.00. On Saturday, 01/24/15 I ran the newly rewired solar system and new batteries through a day of full use and the system not only provided all of our electricity that we were using, but also fully charged the batteries before the sun went down. It is nice to finally have a fully functioning solar system that can provide plenty of power for boondocking opportunities. 01/25/15 - 02/15/15 Salome, AZ Camped at Desert Vista RV Resort (KOA Campground/Thousand Trails/Encore) in Salome, AZ for 21 nights in a 30 Amp FHU site. This campground is located in a low desert valley north of I-10 on US Hwy 60 with the Harcuvar Mountains to the north and the Harquahala Mountains to the south. The amenities include: a clubhouse; swimming pool; Whirlpool/Spa/Hot Tub; Public Restrooms/Showers; Laundry Facilities; Mini Golf; and Laundry Facilities. This is one of our Thousand Trails bonus parks that is available as free to us for a 5 year time frame. It is a very nice Encore campground with 125 campsites. We are Elite Connections members of Thousand Trails/NACO/Leisure Time/Mid-Atlantic/Outdoor World; a private campground membership. Our yearly maintenance fee of $607.87 allows us unlimited camping with no nightly camping fees at 81 different Thousand Trails/NACO/Leisure Time/Mid-Atlantic/Outdoor World nationwide campgrounds plus currently we get 14 extra bonus parks which are Encore campgrounds. This is a highly recommended Encore RV Resort! Note 1: On arrival at Desert Vista RV Resort, we were told our maximum stay as a Thousand Trails member at this now KOA park (owned by ELS) was 14 nights, even though we have a Thousand Trails reservation confirmation for 21 nights for free. Also this park charges a $4.00 per night fee for all reservations under 30 days in length. According to Thousand Trails, since this is one of our bonus parks, we should have been allowed to stay for 21 continuous nights for free. We finally worked it out with this KOA park to let us stay for the full 21 nights at a cost of $4.00 per night for a total cost of $87.00 which included local taxes. This park normally charges $30.00 per night stay and an additional $4.00 per night fee for reservations under 30 nights total. I also notified Thousand Trails of the rule changes at this KOA park. Note 2: On Weds., 02/28/15 we rode first class on the Verde Canyon Railroad Wilderness Route. This was a 4 hour train ride that left from Clarkdale, AZ, went 20 miles out to Perkins, AZ, and then 20 miles back. The train is a fully restored vintage train that was pulled by two FP7 locomotives (2 of only 10 remaining in North America. First Class tickets cost $89.95 each plus taxes. Deb and I attended a Diamond Resorts 90 min. sales presentation and was able to buy our tickets for $30.00 each. The train route follows alongside the Verde River and through some beautiful red rock canyons at an average speed of 10 miles per hour. The trip included a nice lunch and narrations about the surrounding history, geology, and wildlife. We both highly recommend this scenic train ride to anyone else that is thinking of taking the trip. Note 3: On Tues., 02/10/15 we drove to Echo Lodge Resort in Parker Dam, CA to visit our RV friends from the 2012 SMART Alaska Caravan. We enjoyed happy hour at their campsite on the Colorado River frontage, and took a tour of their new & very nice 41 ft/3 slide out Fleetwood Discovery RV. Our friends Carl Hopper & Gwen Hopper cooked up a delicious meal consisting of grill chicken breasts, mashed potatoes, salad, dinner roll, & red wine. Their friends Mark Avey & Linda Avey were there for the happy hour & dinner. Don, Carl, & Mark are all retired Army veterans. It was so nice to hook up with our friends after not seeing them since Aug. 2012. Note 4: On Thurs., 02/12/15 we took the ferry over to the Havasu Landing Resort & Casino in Havasu Lake, CA. The ferry ride was $2.00 per adult round trip. The lunch we had at the Trails End Restaurant was delicious & reasonably priced. Since our scheduled 4 hour boat tour of Lake Havasu was canceled due to high winds on Weds., 02/11/15, this was a nice alternative to at least get out on the lake. This resort & casino is located on the Chemehuevi Indian Tribe reservation on the west shores of Lake Havasu in CA. Note 4: On Sat., 02/14/15 I took Deb out to dinner at the Iron Horse Bar & Grill in Salome, AZ for Valentine's Day. My wife is the love of my life, my best friend, and my full-time, traveling companion. Not too many women that would even consider the mobile RV lifestyle, and she truly loves it as much as I do, so I feel very lucky & blessed to have her in my life. TS1: From Sun., 01/25/15 - 02/01/15 we stayed at The Ridge on Sedona Golf Resort for 7 nights in a timeshare exchange in Sedona, AZ; we stayed in a 2 BR villa. This resort is part of the Diamond Resorts International, and is located in the beautiful red rock area. This part of the country is perfect for January/February visits because of its mild Winter temps. This is an Interval International gold premiere resort that we acquired by exchanging one week with one of the timeshares we already own (WorldMark & Vacation Internationale). We love timesharing and we love exchanging timeshares with Interval International!!! TS2: From Fri., 02/06/15 - Fri., 02/13/15 we stayed at the London Bridge Resort for 7 nights in a timeshare exchange in Lake Havasu, AZ; we stayed in a 2 BR villa. The London Bridge Resort is an all-suite waterfront property, situated on 110 acres along the Colorado River and Lake Havasu. The resort is adjacent to the famous London Bridge and the Bridgewater Channel. This part of the country is perfect for February visits because of its mild Winter temps. This is an Interval International resort that we acquired by exchanging one week with one of the timeshares we already own (WorldMark & Vacation Internationale). We love timesharing and we love exchanging timeshares with Interval International!!! 02/15/15 - 02/24/15 Salome, AZ Camped at Desert Gem RV Park (Passport America Campground) in Salome, AZ for 9 nights in a level, pull thru, 30 amp FHU site. This is a smaller RV park making for tighter turns. It has 57 sites with about 15 of them big enough to accommodate our 45 ft. RV. The Amenities include Public Restrooms/Showers, Clubhouse, Game Room, Fire Rings, Horse Shoes, & inexpensive WiFi ($4 per week, plus $1 per day for the additional 2 nights). We decided to stay at this park since we were unable to find any other desirable RV parks (with availability) on our route from Salome, AZ to the Good Sam Rally at the Phoenix International Raceway. We used our Passport America Lifetime Membership to stay at this RV park at half price for nine (09) nights of parking; normal price is $30.00 per night plus tax, but we paid the $105.00 weekly rate for the first 7 nights, then $16.00 plus taxes for a total cost of $135.85 for our nine (09) night stay which included taxes & WiFi costs. This is a recommended Passport America campground when considering availability, costs, cleanliness, & dependable WiFi access! 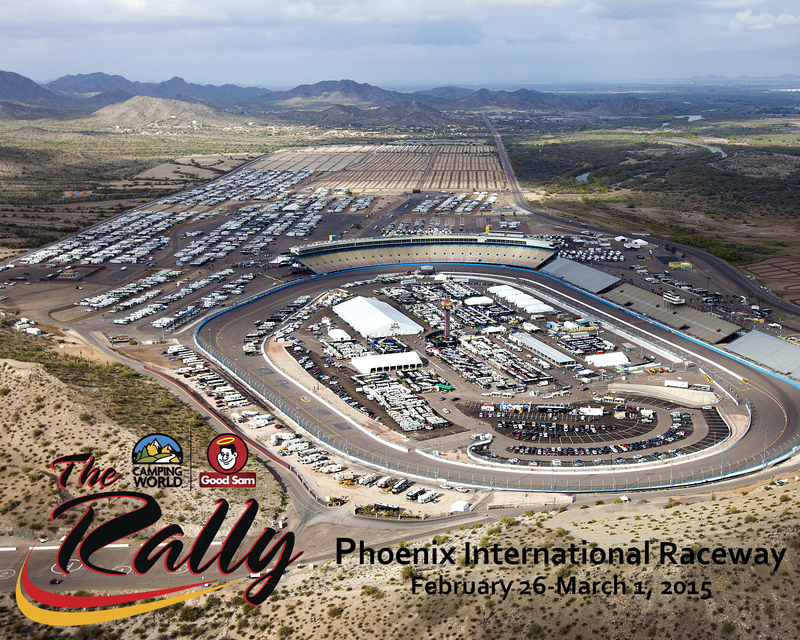 02/24/15 - 03/02/15 Goodyear, AZ Attended the Good Sam 2015 The Rally in Goodyear, AZ (next to Phoenix, AZ) at the Phoenix International Raceway. Since we took advantage of the 2 extra nights early bird special, we stayed for a total of 5 nights in a 30 Amp electric only site. The total cost of this 5 night rally was $374.00. The cost of this rally included RV parking with electric & water, seminars, entertainment, and some snacks/beverages. Note 1: On Weds., 02/25/15 we had Shade Pro RV Awnings out of El Cajon, CA, replace the back two smaller slide-out toppers, for the bedroom, at the rear of the motorcoach, and tighten up the slide-out topper over the driver's side living room slideout. The total cost for parts & labor came to $631.10. The installer named Jerad Mattingly told me the reason we are having problems with our awnings is because Newmar Corporation installed all of them incorrectly. Newmar installed all of the slide-out topper awnings absolutely flat & level, so they always hold water rather than shed water. He told me the top of the slide-out topper should be 2 1/2" higher at the inside top edge than the outer lower edge. If Newmar would have installed the top edge just below the roof line and the bottom edge much lower, the slide-out topper awnings would be shedding water like they should rather than all forming swimming pools over the slide-outs. We like our Newmar Motorcoach, but this is another example that they are as incompetent as the rest of the RV motorcoach builders. Yes, they use higher quality parts, thus their motorcoaches are much more expensive, but they install so many things incorrectly it really boggles the mind on how they do so many dumbass things. So much for Amish quality work being the best work possible, it is all BS hype by Newmar Corp.; the Amish quality of workmanship is no better than non-Amish RV builders. 03/02/15 - 03/05/15 Elroy, AZ Camped at Picacho Peak State Park (next to Eloy, AZ) for three nights with 50 Amp electric only site. This is a beautiful campground located at northwest base of Picacho Peak. This campground has 85 electric only sites on wide, level, long, asphalt pads & all asphalt roads. Each campsite has a fire ring with a picnic table (covered or uncovered). The campground is laid out with 3 loops that include public restrooms/showers. The view at this seasonal campground (open winters only) is very beautiful. We simply dumped our black & grey tanks & filled up with fresh water as we drove into the campground; we will do the same as we leave to go to the upcoming Escapees RV rally called an Escapade. The cost to camp here was $25 per night for a total of $75 for the 3 night stay. I opted to pay the park $7.95 for there 3 day unlimited internet service since Sprint phone coverage here is just a bit spotty. We could have also stayed at a local GNP campground for $28.00 per night, or a local military base for $25.00 per night (after 1 or 2 days of dry camping), so we opted for this very nice state park campground. We highly recommend this Arizona State Park & Campground to anyone! 03/05/15 - 03/06/15 Tucson, AZ Dry Camped at the Pilot Truck Stop located southeast of Tucson, AZ just off of I-10 for one night. We parked at Grid Coordinates Latitude 32� 7'31.55"N / Longitude 110�52'21.14"W.
Note 1: On 03/04/15, while at the Picacho Peak State Park, our refrigerator stop getting cold. I took the RV to Merrigan's AZ Road-Runner RV Service Center. They went ahead and put in a new Thermister which they had in stock. The Thermister cost $39.00 plus $45.00 labor for a grand total with taxes of $84.28. Note 2: While at this Pilot Truck Stop I filled up the RV with diesel. It took 59.624 gallons (approximately 1/3rd of a tank) at 2.76 per gallon for a total cost of $164.50. 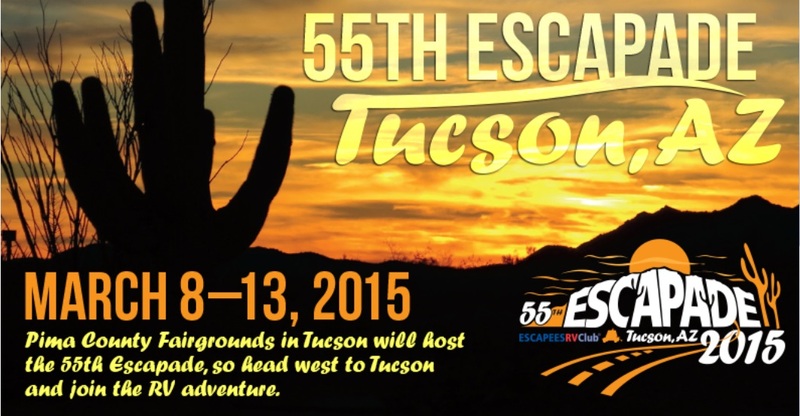 03/06/15 - 03/13/15 Tucson, AZ Attended the Escapees (SKPs) 2015 55th Annual Escapade in Tucson, AZ at the Pima County Fairgrounds. Since we took advantage of the 2 extra nights early bird special, we stayed for a total of 7 nights in a 30 Amp electric & water only site. The total cost of this 7 night rally was $349.00. The cost of this rally included RV parking with electric & water, seminars, entertainment, and some free morning coffee. Note 1: On Sun., 03/08/15 we watched The Rivoli Revue (Ron & Kay Rivoli). They are singers, songwriters, and Indie recording artists. They frequent many RV rallies around the country to entertain with their folksy, style of music. We enjoyed their musical performance as good, wholesome, entertainment. Note 2: On Mon., 03/09/15 we watched Brent Webb "The Master Mind". Brent is a mentalist which has won numerous awards, appeared with many other comics, and has had guest appearances on numerous TV shows. We enjoyed his performance as excellent form of entertainment. Note 3: On, Tues, 03/10/15 we visited the Arizona- Sedona Desert Museum, the Saquaro National Park (west), and the Tucson Mountain Park (Pima County, Tucson, Arizona). The desert museum was absolutely terrible, and way over priced. The cost of the museum was $20.00 per person, so $40 for the two of us to visit. I definitely DO NOT recommend the AZ-Sedona Desert Museum to anyone - stay clear of it and save your money (You Have Been Warned). The national park (west) and the state park were very desert scenic with numerous rock formations and lots of saquaro cactus to see. Later that evening at 7:30 PM, Deb and I went to a Star Party hosted by nationally known astronomy educator Gary Tomlinson. We took our lawn chairs out to set under the Arizona night skies in a large parking are within the Pima County Fairgrounds. Gary pointed out all of the various planets & star constellations that could be seen with the naked eye. This astronomy class was very enjoyable for both of us. Note 4: On. Weds, 03/11/15 we attended the 1 hour seminar titled Escape To Mexico. This seminar was taught by Lin & Markye Hines whom are members of the Escapees Chapter 8 - The Mexican Connection. They have made numerous trips into Mexico with their motorcoach, and want to assure others that Mexico can be experienced by RVers with confidence. Deb and I plan to make a future trip into Mexico with our motorcoach, so we just wanted to start exploring such information. When we do go into Mexico, it will be as part of Escapee's Mexican Connection Chapter 8 to either Kino Bay, Sonora, Mexico or Puerto Pe�asco, Sonora, Mexico. Both of these popular RV destinations are located on the upper part of the Gulf of California. 03/13/15 - 03/25/15 Palm Desert, CA Camped at Palm Springs RV Resort (Thousand Trails Campground) in Palm Desert, CA (located next to Palm Springs, CA) for 12 nights in a 50 Amp FHU site. This campground is located in the beautiful Coachella Valley on a 25 acre campground. The amenities include: a clubhouse; shuffleboard; swimming pool; Whirlpool/Spa/Hot Tub; Fitness Center; Public Restrooms/Showers; Laundry Facilities; Playground; Horseshoes; Game Room/Billiards; and Pickleball. Very nice Thousand Trails preserve with 401 campsites. We are Elite Connections members of Thousand Trails/NACO/Leisure Time/Mid-Atlantic/Outdoor World; a private campground membership. Our yearly maintenance fee of $607.87 allows us unlimited camping with no nightly camping fees at 81 different Thousand Trails/NACO/Leisure Time/Mid-Atlantic/Outdoor World nationwide campgrounds plus currently we get 14 extra bonus parks which are Encore campgrounds. This is a highly recommended Thousand Trails RV Resort! Note 1: In route to this campground we purchased 38.962 gallons of diesel fuel (approx. 1/4 tank) at $2.65 per gallon costing a total of $103.21. Note 2: On Sun., 03/15/15 Debbie's childhood friends Janet Howell Jerome, Jarvis Howell, Jerry Howell, Jackie Benjamin, and Brenda Walker all stopped by for a few hours to visit. They brought along some excellent Vegan food and Debbie was so happy to see her longtime friends. Note 3: On Mon., 03/16/15 Debbie's cousin Beverley Collins and her friend Milton La Ponte came to our RV campsite for a visit. They treated us to a nice buffet lunch at the Fantasy Springs Resort Casino a few miles away in Indio, CA, then we came back to the RV for several hours of conversation. It was such a wonderful day for all of us. Note 4: On Thurs., 03/19/15 Debbie's friends Bertha Edwards-Tutt and her son Keith Tutt came to our RV campsite for a visit. This was another nice visit from friends that live in southern California. 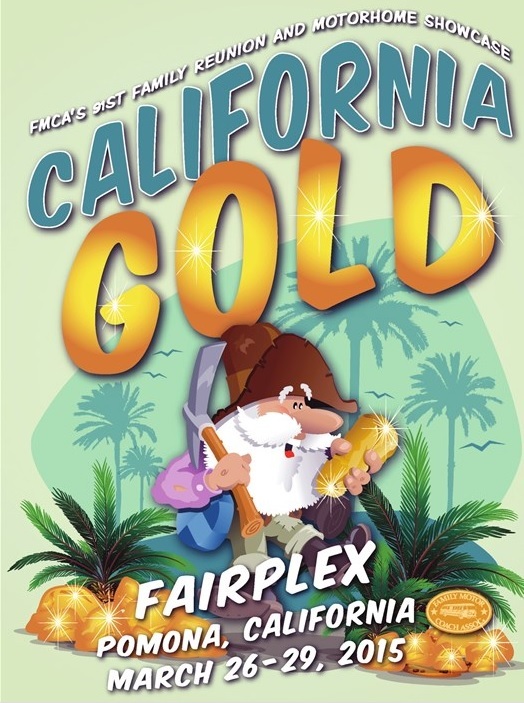 03/25/15 - 03/30/15 Los Angeles, CA Attended the FMCA 2015 91st International Convention & Rally at the Los Angeles County Fairplex in Pomona, CA for 5 nights in a 30 Amp electric only site. The site is on a level asphalt parking lot (asphalt parking is better than grass, especially if it were to rain). The total cost of this 3 day rally plus the 2 extra early days was $380.00. The cost of this rally included RV parking with electric, seminars, entertainment, and some snacks/beverages. Note 1: On Weds., 03/25/15 Debbie's aunt Barbara Mills Martin came to our RV campsite for a visit. It was very nice seeing Barbara again. Note 2: On Thurs., 03/26/15 we visited the National Hot Rod Association (NHRA) Motorsports Museum in Pomona, CA. The regular cost is $10.00 per person, but we got in for $7.00 per person as AAA members. The museum was actually quite good. Interesting fact I learned at the museum is that current dragsters are hitting over 330 MPH speeds in about 3.7 seconds in the 1/4th mile tracks. In fact, if a NASCAR race car were to hit the starting line at there normal racing speeds, the NHRA dragsters (starting from a complete stop) would still beat them in a 1/4th mile race track. WOW! Note 3: On Weds., 03/29/15 Debbie and I took our niece Jessica Gray out to dinner to meet up with several of our FMCA RV friends at the Caff� Allegro Ristorante Italiano in old town La Verne, CA. The food, atmosphere, and company were great. It was a wonderful way to finish off the three big RV rallies we just finished attending (Escapees Escapade, Good Sam The Rally, & the FMCA International Rally). 03/30/15 - 04/04/15 March ARB, CA Camped at March ARB FamCamp (Military Campground/US Air Force) (next to Edgemont, CA & Moreno Valley, CA) for 5 nights in the March Air Reserve Base with 40 FHU 50 amp sites which consist of 10 pull-thru sites & 30 back-in sites. We got a nice level concrete pad, a shaded lawn area, nice picnic table, shaded patio furniture, and 50 amps FHU site for $17.00 per day. Behind our rig is the building that houses the flight simulators for the C-17 and KC 135R aircraft and the Department of Homeland Security (DHS) Marine & Air Operations Center (MAOC). Next to the RV park are the secure RV storage lots (that we used during April 2015), and not too far away was the flight line where we went to watch the large Boeing C-17 Globemaster III and Boeing KC 135R Stratotanker military aircrafts doing their flight training (landings & take-offs). This is a highly recommended Military Campground for active/retired military! Note 1: On Tues., 03/31/15 Debbie picked up her mom Pearl and brought her out to our RV for a day long visit. It was great seeing her again. Debbie was was able to do many visits with her mom during our two March ARB week long stays. Pearl also spent a good amount of time with us during our WorldMark Oceanside timeshare stay too. Note 2: On Sat., 04/04/15 until Sat., 04/11/15 we went on a California Coastal Cruise on the Princess' Crown Princess for 7 days. While on this cruise our RV was parked in a storage lot on the March Air Reserve Base and we drove our SUV to the cruise terminal. The cost for the military secured storage was $35 per month which covered the entire month of April. Since we needed RV storage for our 7 day cruise and our 10 day timeshare stay, it made good sense to simply pay for one month of RV storage at this great rate. Note 3: On Sat., 04/11/15 we spent the night at Byron Allen's condo (Debbie's brother) for one night in his spare bedroom. He lives in a very nice gated community in Irvine, CA. Deb and I along with Byron and his girlfriend Francesca went out to dinner at The Cheesecake Factory in Irvine, ordered cupcakes for desert from Sprinkle's Cupcakes in Newport Beach, took a drive over to see Byron's business which is the California Truck Driving Academy in Santa Ana, and then took the car transport ferry over to Balboa Island for a drive around the beach communities. During the evening we also watched a couple of Blu-ray movies on his big screen TV and ordered a take out pizza from Roundtable Pizza. This was the first time I ever met Byron; we got along great, and have much in common. It was a really nice family visit and Deb and I truly enjoyed ourselves. 04/12/15 - 04/17/15 March ARB, CA Dry Camped at March ARB FamCamp (Military Campground/US Air Force) (next to Edgemont, CA & Moreno Valley, CA) for 1 night for free, and camped in a 50 amp FHU site for 4 nights (total of 5 nights camping) in the March Air Reserve Base. This military campground has 40 FHU sites which consist of 10 pull-thru sites & 30 back-in sites. We got a nice level asphalt pad, a shaded lawn area behind the coach with a nice picnic table with patio furniture for $17.00 per day (total cost $68.00). This is a highly recommended Military Campground for active/retired military! 04/17/15 - 04/27/15 Oceanside, CA Stayed at WorldMark Oceanside for 10 nights in one of our timeshares; we stayed in a 2 BR suite. Located in Oceanside, CA in north San Diego County, CA on the Pacific Ocean beachfront. This part of the country is perfect for April visits because of its beautiful Spring weather. We love WorldMark and we love staying in timeshares!!! Note 1: On Fri., 04/17/15 until Mon., 04/27/15 while staying in our WorldMark Oceanside timeshare our RV was parked in a storage lot on the March Air Reserve Base and we drove our SUV to the timeshare. The cost for the military secured storage was $35 per month which covered the entire month of April. Since we needed RV storage for our 7 day cruise and our 10 day timeshare stay, it made good sense to simply pay for one month of RV storage at this great rate. Note 2: During our Oceanside timeshare stay we had Debbie's mom Pearl Mills Allen-Shaffer (from Moreno Valley, CA) stay with us the entire time on the murphy bed. Also, Debbie's former co-worker Carolyn M. Barnett (from Apple Valley, CA) and her sister Valorie Cleveland (from Baton Rouge, LA) stayed in the 2nd bedroom for the first 7 nights (04/17 to 04/24). Note 3: On Sun., 04/26/15, Deb and I along with Pearl Mills Allen-Shaffer (Deb's mom), Beverley Collins (Debbie & Pearl's cousin) and her friend Milton La Ponte all went The Belles of Blues (7th Annual Blues Day) from 1:00 to 4:00 PM at The Flower Fields at Carlsbad Ranch, in Carlsbad, CA. 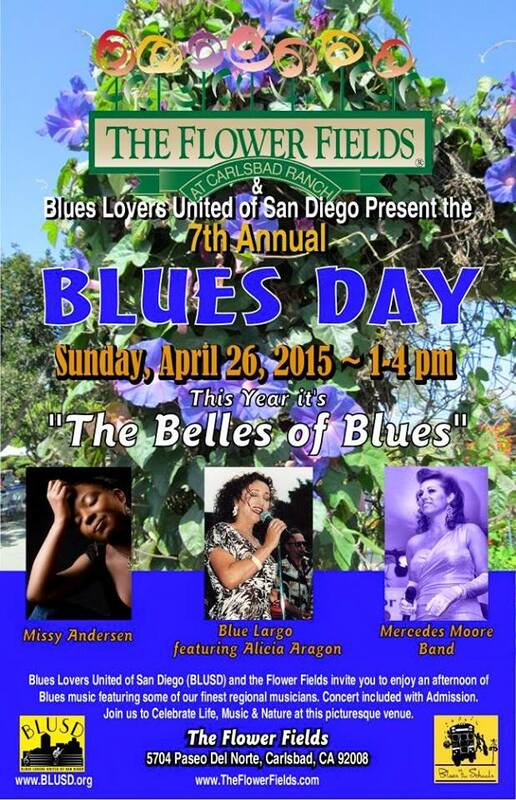 The Belles of Blues (7th Annual Blues Day) was sponsored by the Blues Lovers United Of San Diego. The cost to enter the flower fields & attend the festival was $11.00 per person with my military ID. The weather was beautiful, the music was great, and all had a good time. After the event we all went out to dinner at King's Fish House in Carlsbad, CA. The food was a tad bit pricey, but the quality and portions were just fine. 04/27/15 - 05/18/15 Menifee, CA Camped at Wilderness Lakes RV Resort (Thousand Trails Campground) in Menifee, CA for 21 nights in a 50 Amp FHU site. This campground is located in the beautiful 80 acre campground in Riverside County, CA. The amenities include: a clubhouse; shuffleboard; swimming pool; Whirlpool/Spa/Hot Tub; Fitness Center; Public Restrooms/Showers; Laundry Facilities; Playground; Horseshoes; Game Room/Billiards; and Pickleball. Very nice Thousand Trails preserve with 523 campsites. We are Elite Connections members of Thousand Trails/NACO/Leisure Time/Mid-Atlantic/Outdoor World; a private campground membership. Our yearly maintenance fee of $607.87 allows us unlimited free camping at 81 different Thousand Trails/NACO/Leisure Time/Mid-Atlantic/Outdoor World nationwide campgrounds plus currently we get 14 extra bonus parks which are Encore campgrounds. This is a highly recommended Thousand Trails RV Resort! 05/18/15 - 05/22/15 Beaumont, CA Camped at Cherry Valley Lakes Resort (C2C/RPI) in Beaumont, CA for 4 nights in a 30 Amp FHU site. The campground has 140 full sites. The campground amenities include: Clubhouse, bathhouse, hot tub, laundry facilities, swimming pool, playground, picnic area, game room, fishing, & horseshoes. Very nice Colorado River Adventures C2C premiere/RPI preferred RV park. We are C2C Deluxe/RPI Preferred Gold with Resort Connections members. These private campground memberships allow their members to use affiliated public RV parks for C2C Deluxe for $9.20 daily & RPI Preferred $10.00 daily for FHU sites. This is a highly recommended RV Resort! 05/22/15 - 05/25/15 Cabazon, CA Dry Camped at Morongo Casino, Resort, Spa (Indian Casino Free Dry Camping) in Cabazon, CA for 3 nights. We spent Memorial Day weekend at this Indian Casino parked at Lat 33�55'18.50"N /Long 116�47'32.87"W. This dry camp spot is huge, a bit of a slope on the parking area, but it can accommodate numerous rigs of any size. This is a highly recommended free dry camping location! Note 1: On Fri., 05/22/15 we both signed up for a Winner's Club Card. Each of us got $5 of free play, and we get the discounted Winner's Club meal prices. We ate dinner in the Portrero Canyon Buffet a couple of nights which is a bit expensive on weekdays, and very expensive on weekends. The food is excellent in all regards with much variety. Debbie said the dessert selection and taste was the best she had ever eaten, and that is saying a lot considering we travel full-time and eat out often at many various restaurants. 04/25/15 - 05/28/15 Menifee, CA Camped at Wilderness Lakes RV Resort (Thousand Trails Campground) in Menifee, CA for 3 nights in a 50 Amp FHU site. This campground is located in the beautiful 80 acre campground in Riverside County, CA. The amenities include: a clubhouse; shuffleboard; swimming pool; Whirlpool/Spa/Hot Tub; Fitness Center; Public Restrooms/Showers; Laundry Facilities; Playground; Horseshoes; Game Room/Billiards; and Pickleball. Very nice Thousand Trails preserve with 523 campsites. We are Elite Connections members of Thousand Trails/NACO/Leisure Time/Mid-Atlantic/Outdoor World; a private campground membership. Our yearly maintenance fee of $607.87 allows us unlimited free camping at 81 different Thousand Trails/NACO/Leisure Time/Mid-Atlantic/Outdoor World nationwide campgrounds plus currently we get 14 extra bonus parks which are Encore campgrounds. This is a highly recommended Thousand Trails RV Resort! Note 1: In route to this campground, we filled up our RV at the Morongo Casino fuel station. We put in 95.558 gallons of diesel fuel at $3.039 per gallon for a total cost of $290.40 for diesel fuel. Our RV tank capacity is 150 gallons so this was more than half a tank of fuel. Note 2: On Weds., 05/27/15 we had our Dometic electric/LP fridge repaired. Three weeks earlier the cooling system on the fridge failed while at this same campground. It took this long to get in the correct part which was hard to find for our 12 year old fridge. The facility that did the repairs was Giant RV - Murrieta. The total cost for the parts, labor & taxes was $2,019.55. The Good Sam Extended Warranty covered $1717.28 and we paid $302.27. A week earlier I had ordered a new Dometic Replacement Board at a total cost with shipping of $108.65. The cost of $302.27 (that we paid Giant RV) included our $250.00 warranty plan deductible plus $52.27 for installing that new fridge replacement board. Note 3: On Thurs., 05/28/15 we filled up our 65 gallon RV LP tank here at Thousand Trails before we hit the road. We purchased 18.5 gallons of propane at $2.90 per gallon for a total cost with tax of $57.94. 05/28/15 - 05/31/15 Three Rivers, CA Dry Camped at Sequoia RV Ranch (Good Sam Campground) in Three Rivers, CA for 3 nights. We stayed in their Oak Meadow Dry Camping Area for a cost of $25.00 per night which is $75.00 total, we got a 10% Good Sam Club discount which was $7.50, for a grand total cost of $67.50 for the 3 night stay. Nestled in the Sierra Nevada foothills only 8 miles from Sequoia National Park, the Sequoia RV Ranch offers fun and relaxing camping in a breathtaking natural setting. Open year-round, the ranch offers spacious and secluded campsites, many of which are positioned along the picturesque Kaweah River. This is a recommended RV Resort! Note 1: On Fri., 05/29/15 we visited Sequoia National Park (including General Sherman Tree), Foothills Visitor Center (Sequoia NP), Giant Forest Museum (Sequoia NP), Lodgepole Visitor Center (Sequoia NP), Giant Sequoia National Monument, Kings Canyon National Park (including General Grant Tree), and Kings Canyon Visitors Center (Kings Canyon NP). We drove the Generals Highway from the Ash Mountain Entrance at the southwest end of the Sequoia National Park on Route 198 north and exited the Big Stump Entrance at the west end of the Kings Canyon National Park on Route 180 west to Route 245 south. While driving through the National Parks today, we saw numerous Black Bears with cubs, Mule Deer with fawns, as well as ground squirrels, chipmunks, and all sorts of birds. The sad thing was all of the dead and dying trees, including the Sequoia's from drought conditions, bark beetles, air pollution, and chem-trailing; numerous chem-trails were being sprayed into the skies the entire day long. In fact all the milky white clouds in the skies were chem-clouds and not natural clouds - this is a sad but very real truth. 05/31/15 - 06/08/15 Bass Lake, CA Camped at Bass Lake RV Resort (C2C) in Bass Lake, CA for 8 nights in a 50 Amp FHU site. The campground has 147 full sites, 6 partial sites, and 10 of the 147 sites are pull thru sites. The campground is located just a short walk from the shores of Bass Lake. The campground amenities include: Recreation hall, outdoor pool, WiFi access in campground (terrible to non-existent), internet access in clubhouse, adult club house, fishing available, hiking trails, picnic tables, playground, shuffleboard, snack bar, gift shop, teen center, fitness room, laundry, horseshoes, cable TV, game room, pool table, propane, hot showers, ice available, fishing nearby, boating nearby, shopping nearby. Nearby: lake within walking distance, water skiing, sailing, swimming and marina.. Very nice C2C deluxe RV park. We are C2C Deluxe members. This private campground membership allows their members to use affiliated public RV parks for C2C Deluxe for $9.20 daily for FHU sites. We did also pay an extra $11.50 per day for 50 amp electric at this park which came to a total electric charge of $92.00. Therefore our total cost to stay at this park was $20.70 per night which still isn't a bad price for such a nice California RV park with FHU sites located near a large, beautiful, mountain lake. This is a highly recommended RV Resort! Note 1: In route to this campground, we filled up our RV diesel tank. We put in 40.3366 gallons of diesel fuel at $3.099 per gallon for a total cost of $125.00 for diesel fuel. Our RV tank capacity is 150 gallons so this was approximately 1/4th of a tank of fuel. 06/08/15 - 06/29/15 Groveland, CA Camped at Yosemite Lakes RV Resort (Thousand Trails Campground) in Groveland, CA for 21 nights in a 30 Amp FHU site. This 400 acre camping preserve is located just 5 miles from Yosemite National Park and the south fork of the Tuolumne River runs right through the property. The amenities include: a clubhouse; shuffleboard; swimming pool; Whirlpool/Spa/Hot Tub; Fitness Center; Public Restrooms/Showers; Laundry Facilities; Playground; Horseshoes; Game Room/Billiards; and Pickleball. Very nice Thousand Trails preserve with 523 campsites. We are Elite Connections members of Thousand Trails/NACO/Leisure Time/Mid-Atlantic/Outdoor World; a private campground membership. Our yearly maintenance fee of $607.87 allows unlimited camping with no nightly camping fees at 81 different Thousand Trails/NACO/Leisure Time/Mid-Atlantic/Outdoor World nationwide campgrounds plus currently we get 14 extra bonus parks which are Encore campgrounds. This is a highly recommended Thousand Trails RV Resort! Note 1: On Thurs., 06/18/15 we visited the Groveland Yosemite Gateway Museum which had some great information on the history of Groveland, CA & Yosemite National Park, including the mining industry, the timber industry, local flora & fauna, and much more. We also watched a 40 min. movie titled Yosemite Discovery which covered all four seasons at the national park. Then we went out to lunch at the Iron Door Saloon & Grill in Groveland, CA. This saloon claims to be the oldest saloon in California. We both had burgers & fries. The food was good, but extremely expensive. 06/29/15 - 07/13/15 Isleton, CA Camped at Lighthouse Marina, Restaurant & Resort (C2C/RPI) in Isleton, CA for 14 nights in a 30 amp & water site. This RV park has 120 full sites and 56 partial sites with all being back-in sites. Our campsite does not have sewer, but the campground has a free dump station. The RV park is beautifully landscaped, located in the Sacramento delta region on the north fork of the Mokolumne River, and has its own marina. The park amenities include: Recreation hall, game room, outdoor pool, grocery -convenience store, rental units, boating available, boat launch, bait, marine facilities, playground, TV lounge, basketball, volleyball, tetherball, bingo, water skiing, boat and RV storage, dump station, fishing available, ice available, restaurant (full service), lounge located on the river, group activities, 18-hole mini golf, horseshoes, library, handicap access, restrooms, hot showers, laundry, picnic tables and propane, fishing nearby, boating nearby. This is a very nice deluxe RV park that affiliates with C2C/RPI. We are C2C Deluxe/RPI Preferred Gold with Resort Connections members. These private campground memberships allow their members to use affiliated public RV parks for C2C Deluxe for $9.20 daily & RPI Preferred Gold $10.00 daily. This is a highly recommended RV Resort! 07/13/15 - 08/03/15 Lotus, CA Camped at Ponderosa RV Resort (Thousand Trails Campground) in Lotus, CA for 21 nights in a 30 Amp FHU site. This camping preserve is located on the south fork of the American River. The amenities include: Clubhouse, Swimming Pool, Fishing, WiFi, RV Storage, Nature/Hiking Trails, Restroom/Shower Facilities, Picnic/BBQ Area, Playground, Volleyball, Horseshoes, Game Room/Billiards, and Bocci Ball. This is a very nice NACO preserve with 146 campsites. We are Elite Connections members of Thousand Trails/NACO/Leisure Time/Mid-Atlantic/Outdoor World; a private campground membership. Our yearly maintenance fee of $607.87 allows us unlimited free camping at 81 different Thousand Trails/NACO/Leisure Time/Mid-Atlantic/Outdoor World nationwide campgrounds plus currently we get 14 extra bonus parks which are Encore campgrounds. This is a highly recommended Thousand Trails RV Resort! 08/03/15 - 08/24/15 Nicolaus, CA Camped at Lake Minden RV Resort (Thousand Trails Campground) in Nicolaus, CA for 21 nights in a 30 Amp FHU site. This camping preserve is located on the shores of Lake Minden which is a 41 acre private lake. The amenities include: Fishing, Lake Frontage, Store, Nature/Hiking Trails, Mini Golf, Restroom/Shower Facilities, Bock Dock/Marina, Picnic/BBQ Area, Playground, Volleyball, Basketball, Tennis Courts, and Game Room/Billiards. This is a very nice NACO preserve with 212 campsites. We are Elite Connections members of Thousand Trails/NACO/Leisure Time/Mid-Atlantic/Outdoor World; a private campground membership. Our yearly maintenance fee of $607.87 allows us unlimited free camping at 81 different Thousand Trails/NACO/Leisure Time/Mid-Atlantic/Outdoor World nationwide campgrounds plus currently we get 14 extra bonus parks which are Encore campgrounds. This is a highly recommended Thousand Trails RV Resort! 08/24/15 - 09/14/15 Oregon House, CA Camped at Lake Of The Springs RV Resort (Thousand Trails Campground) in Oregon House, CA for 23 nights in a 30 Amp FHU site. This camping preserve is located on 950 acres in the foothills of the Sierra Mountains. This campground is situated amongst a mixture of pine & hardwood trees and the main attraction is a 120 acre private lake called Lake of the Springs (formerly Lake Mildred). The amenities include: Bike Trails, Shuffleboard, Swimming Pool, Fishing, Lake Frontage, Store, Nature/Hiking Trails, Mini Golf, Restroom/Shower Facilities, Laundry Facilities, Boat Docks/Marina, Boat Rental, Picnic/BBQ Area, Playground, Volleyball, Basketball, Horseshoes, Tennis Courts, Ballroom/Banquet Hall, Game Room/Billiards, Library, & Business Center. This is a very nice Thousand Trails preserve with 556 campsites. We are Elite Connections members of Thousand Trails/NACO/Leisure Time/Mid-Atlantic/Outdoor World; a private campground membership. Our yearly maintenance fee of $607.87 allows us unlimited camping with no nightly camping fees at 81 different Thousand Trails/NACO/Leisure Time/Mid-Atlantic/Outdoor World nationwide campgrounds plus currently we get 14 extra bonus parks which are Encore campgrounds. This is a highly recommended Thousand Trails RV Resort! Note 1: August 29th was my 55th birthday, so Deb and I went to the Sutter County Fair in Gridley, CA. We enjoyed some good fairground food, checked out the animal exhibits, watched the Splash Dog competitions, and then attended the 2015 Sutter County Fair Tractor & Truck Pull. Deb and I had a great day and did not get back to the RV until 10:00 PM. 09/14/15 - 10/05/15 Emigrant Gap, CA Camped at Snowflower RV Resort (Thousand Trails Campground) in Emigrant Gap, CA for 19 nights in a 30 Amp FHU site. This camping preserve is located in the pine covered Tahoe National Forest in the Sierra Mountains and has two private lakes: Snowflower Lake & Raccoon Lake. The amenities include: Bike Trails, Swimming Pool, Fishing, Lake Frontage, WiFi, RV Storage, Store, Nature/Hiking Trails, Restroom/Shower Facilities, Picnic/BBQ Area, Playground, Volleyball, Basketball, Horseshoes, Game Room/Billiards, and Business Center. This is a very nice NACO preserve with 208 campsites. We are Elite Connections members of Thousand Trails/NACO/Leisure Time/Mid-Atlantic/Outdoor World; a private campground membership. Our yearly maintenance fee of $607.87 allows us unlimited camping with no nightly camping fees at 81 different Thousand Trails/NACO/Leisure Time/Mid-Atlantic/Outdoor World nationwide campgrounds plus currently we get 14 extra bonus parks which are Encore campgrounds. This is a highly recommended Thousand Trails RV Resort! 10/05/15 - 10/22/15 South Lake Tahoe, CA Camped at Tahoe Valley Campground (Thousand Trails/Encore) (C2C/RPI) in South Lake Tahoe, CA for 17 nights in a 50 Amp FHU site. This campground is located near the southern shores of Lake Tahoe along the Truckee River, and it is nestled in the beautiful pine tree forests of the Eldorado National Forest. The campground is also just a short drive to all of the casinos & restaurants in Stateline, NV. The campground amenities include: Clubhouse; Swimming Pool; Fishing; WiFi; RV Storage; Pets Welcome; Store; Nature/Hiking Trails; Restroom/Shower Facilities; Laundry Facilities; Picnic/BBQ Area; Playground; Volleyball; Basketball; Horseshoes; Tennis Courts; Pickleball; and Private Mailbox/Mail Center. This is one of our Thousand Trails bonus parks that is available as free to us for a 5 year time frame. It is a very nice Encore campground with 439 campsites. We are Elite Connections members of Thousand Trails/NACO/Leisure Time/Mid-Atlantic/Outdoor World; a private campground membership. Our yearly maintenance fee of $607.87 allows us unlimited camping with no nightly camping fees at 81 different Thousand Trails/NACO/Leisure Time/Mid-Atlantic/Outdoor World nationwide campgrounds plus currently we get 14 extra bonus parks which are Encore campgrounds. This is a highly recommended Encore RV Resort! Note 1: On Sun., 10/18/15 we stayed at our WorldMark Lake Tahoe timeshare in a one BR suite for one night in Stateline, NV. We have never stayed at this resort, and since a last minute room came available, we decided to take advantage of it. We also enjoyed this evening as our date night and took in a movie and dined out in South Lake Tahoe, CA. Our RV was left set up and safely parked in our site at Tahoe Valley Campground. Note 2: We have looked forward to this beautiful US HWY 395 south route going south from the Lake Tahoe/Reno area down to where it ends and ties in with I-15 in Hesperia, CA. This is one of the most beautiful, scenic drives in the USA. We are driving this route for a total of 5 straight weeks staying in several campground located on various different beautiful lakes. 10/22/15 - 10/25/15 Gardnerville, NV Camped at Topaz Lodge RV Park for 5 nights in Gardnerville, NV. This casino RV park has 59 FHU sites with great views of Topaz Lake & the Sweetwater Mountains. The 50 Amp FHU sites cost $22.00 (plus tax) per night. The amenities include: Public Restrooms with Showers, Free WiFi, Cable TV, Swimming Pool, Security Patrols, Picnic Tables, BBQ Grills, Horseshoes, a Daily Book of Discount Coupons for both on-site Restaurants to Include One Free Beer or Wine Drink per Person per Day. Note 1: On 10/25/15, while at this campground, before we hit the road, we fueled up our RV. We put in 69.47 gallons of diesel fuel at $2.879 per gallon for a total cost of $200.00 for diesel fuel. Our RV tank capacity is 150 gallons so this was a bit less than 1/2 of a tank of fuel. 10/28/15 - 11/01/15 Bishop, CA Camped at Tri-County Fairgrounds (aka Bishop RV Park) for 5 nights in Bishop, CA. This 42 space Inyo County Fairground RV park is located 2 blocks off of US Hwy 395. This RV park includes another additional 135 electric & water only sites for groups of 10 or more rigs. The amenities include: Public Restrooms with Showers, WiFi Availability, Walking/Biking Trails, and Security Patrols. The 50 amp FHU sites cost $25.00 per night. This RV park is within convenient walking distance to groceries, dining, retail, parks, and entertainments. 11/01/15 - 12/01/15 Indio, CA Stayed at WorldMark Indio for 30 nights in one of our timeshares; we stayed in a 2 BR suite from 11/01/15 to 11/20/15 (19 nights) and a 4 BR presidential suite from 11/20/15 to 12/01/15 (11 nights). Located in Greater Palm Springs, Indio is one of eight desert resort cities of the Coachella Valley offering a vast array of things to do in year-round sunny weather. This part of the country is perfect for November visits because of its mild Winter temps. We plan on inviting all of our friends over for visits, and Debbie will be cooking a Thanksgiving feast here. We love WorldMark and we love staying in timeshares!!! Note 1: In route to the timeshare, we fueled up our RV. We put in 89.186 gallons of diesel fuel at $2.459 per gallon for a total cost of $288.62 for diesel fuel. Our RV tank capacity is 150 gallons so this was a bit more than 1/2 of a tank of fuel. Note 2: During this one month long stay in a timeshare in Indio, CA, we opted to park our rig in the extended stay parking lot at the Fantasy Springs Casino next door. We visited the RV once or twice everyday just to make sure it was safe and sound. Extended stay parking for the RV at the Indian Casino was free. Because of all the solar panels on the roof, we were able to keep the satellite dish deployed and recording the entire time it was parked without running the generator. Note 3: On 11/10/15 our RV ran empty of LP. We drove 7 miles down the road and got our LP tank filled at Palm Springs RV Resort (Thousand Trails campground). We purchased 14 gallons of LP at $3.20 per gallon for a total cost (including taxes) of $48.38. 12/01/15 - 12/21/15 Descanso, CA Camped at Oakzanita Springs RV Campground (Thousand Trails Campground) in Descanso, CA for 20 nights in a 30 Amp FHU site. This camping preserve is located north of San Diego in the Cleveland National Forest, and only 45 minutes from all San Diego attractions. The amenities include: Swimming Pool, Whirlpool/Spa/Hot Tub, WiFi, RV Storage, Restaurant, Store, Mini Golf, Restroom/Shower Facilities, Picnic BBQ Area, Volleyball, Basketball, Horseshoes, Tennis Courts, Game Room/Billiards, Library, Pickleball, and Bocci Ball. This is a very nice Thousand Trails preserve with 118 campsites. We are Elite Connections members of Thousand Trails/NACO/Leisure Time/Mid-Atlantic/Outdoor World; a private campground membership. Our yearly maintenance fee of $617.60 allows us unlimited camping with no nightly camping fees at 81 different Thousand Trails/NACO/Leisure Time/Mid-Atlantic/Outdoor World nationwide campgrounds plus currently we get 14 extra bonus parks which are Encore campgrounds. This is a highly recommended Thousand Trails RV Resort! 12/21/15 - 01/08/16 San Diego, CA Stayed at WorldMark San Diego - Mission Valley for 18 nights in one of our timeshares; we stayed in a 2 BR suite. This resort is located in Greater San Diego area in Mission Valley. This part of the country is perfect for Winter visits because of its mild Winter temps. We plan on inviting all of our friends over for visits during our timeshare stay for the Christmas holiday. We love WorldMark and we love staying in timeshares!!! Note 1: During this 18 day stay in a timeshare in San Diego, CA, we opted to park our RV at a friend's property in Lakeside, CA, and we drove our SUV to the timeshare. This spot is low altitude with warm winter weather so we do not have to worry about any freezing water pipes in the RV while enjoying our timeshare stay.